I had a lot of fun today on a cool little right not too far from the homestead. I rode the board on the right first. 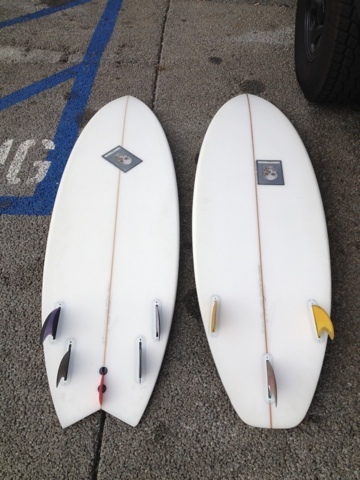 5’8 x 20 x 2 3/16 its the op3 model cutdown I changed the front fins out from the Simon’s I rode yesterday. I got them in Oz last month, they are Haden shapes, they were a touch smaller which made the board feel lil looser. I mean 20″ wide is pretty extreme for me Anyway then i switched to the 5 finner. Which is hand shape. Which is same size and thickness only a quarter inch narrower at 19 3/4. Crazy how much more control I had. I really had a ton o fun on that board today! The 5th fin (knob) is actually called “the knub” or “knubster” works good with the quad set up for wider tails. Hey im pretty sure that this is right by my home break were you in northern manhattan beach?